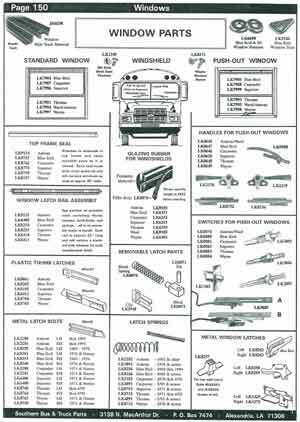 Looking for replacement Window Parts for your Bluebird Vision School Bus? This handle and switch assembly is available as a "kit" and is used on push-out sash assemblies that are vertically hinged. Blue Bird used these window latch parts for about 30-years with only a minor change in the latch springs. From about 1969 thru 1984, the small, thin latch spring was used. Beginning in about 1985, Blue Bird changed to the large spring. 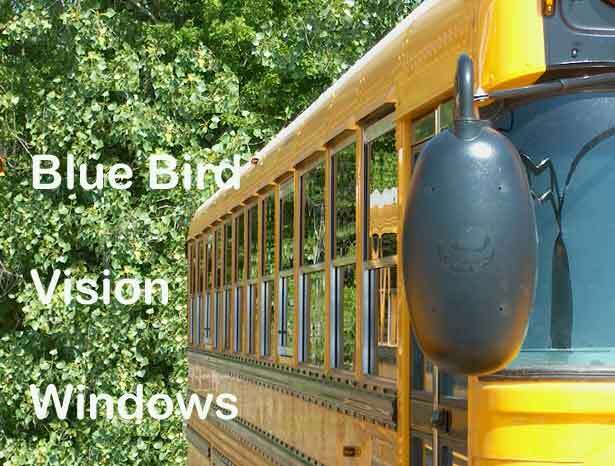 In about 2006, Blue Bird changed their windows to a type that allowed replacement of latches without removal and tear-down of the whole assembly. The parts are not yet available individually, but can be obtained in a kit that repairs both latches (LH and RH) in a window. In about 1961, Blue Bird cahnged to aluminum frames on all of their windows. We still have a few of these latches in stock. Metal latch bolt is no longer available. Blue Bird windows were changed again in approximately 1969. The aluminum window frame design was changed so that small, sliding type latches of the type shown here could be installed.